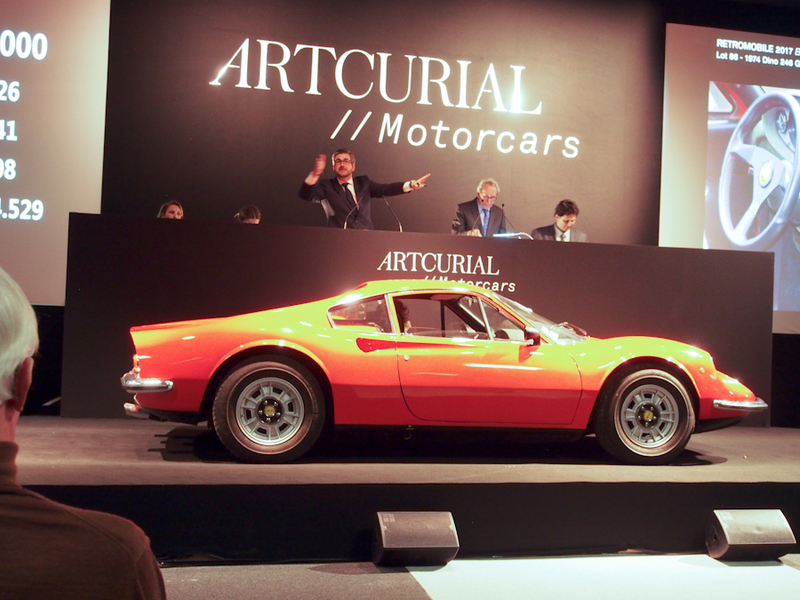 On the numbers Artcurial’s $34.7 million 2017 sale looks light, but that isn’t taking into account the $35 million sale of the Ferrari 335 Sport last year which had no comparable blockbuster in 2017. 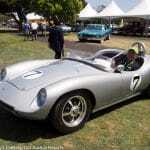 Then there was the $19.1 million sale of the Baillon Collection’s Ferrari 250 GT SWB Cal Spyder two years ago. Without those two bunker-busters 2016’s sale would have been $25 million and 2015’s would have been $30.9 million. 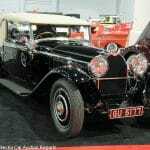 It makes the more equitably distributed 2017 Official Rétromobile sale’s $34.7 million total with a top transaction of just over $4 million a huge success, especially when its US$ total is considered in the context of the currently strong US dollar. 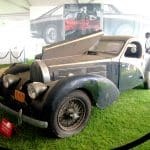 I attended my most recent Artcurial Rétromobile auction three years ago and castigated, in no uncertain terms, the sale’s conduct: No currency converter, nearly all conducted in French, with a cacophony of multiple auctioneers and bid spotters spewing French into the PA system on top of each other and barely a mention of the bids in £ or $. It was beyond confused. 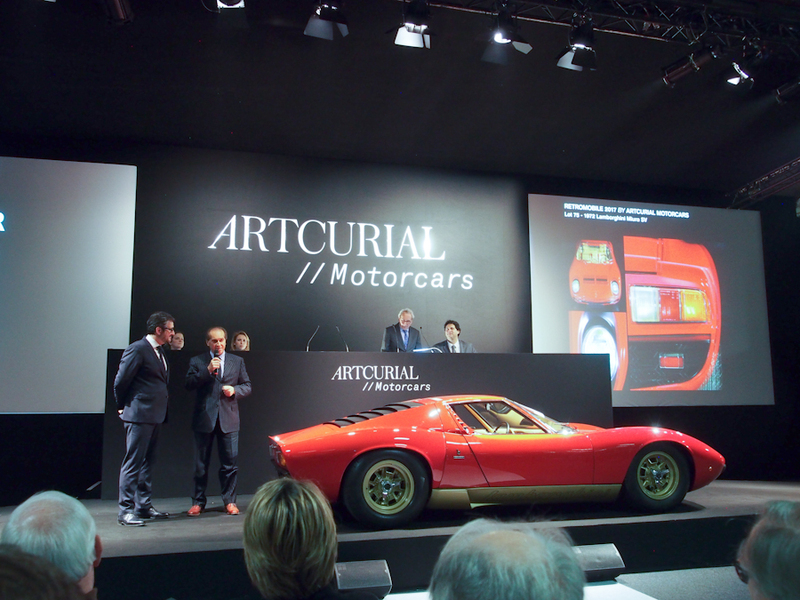 That wasn’t the case in 2017, and for that Artcurial deserves recognition. Yes, Hérve Poulain and Matthieu Lamoure still shared the auction podium and sometimes talked over each other. Another wandered the block with a mic, spotting bids and interjecting freely. But the effect was organized, efficient and created an excitement that added to the presentation. The currency converter worked (even if the latest bids weren’t always recognized) and there was little chance of losing track of the bidding. An efficiently produced production, it was a cross between frenetic American auctions and the reserved British style, appropriate to a state where people eat snails (with garlic butter and parsley) and crush forward in airport lines: Gallic Russo and Steele. Being at the center of the Rétromobile show doesn’t hurt, with a vast exhibition of cars, books and parts that highlights the car collecting passion in France and Europe. 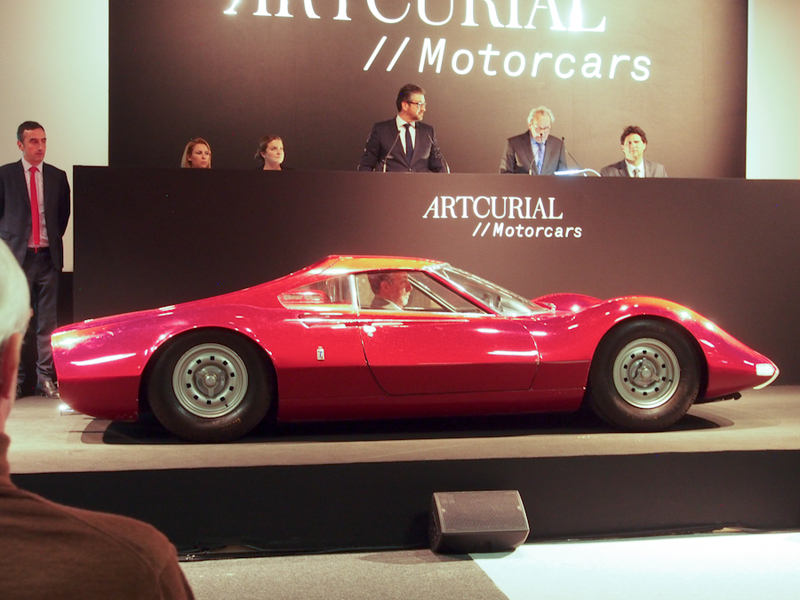 That’s a Good Thing and taking into account the variety of cars in Artcurial’s Rétromobile auction this is an event well worth a trip to Paris to experience, not that any reason for a trip to Paris should be ignored. 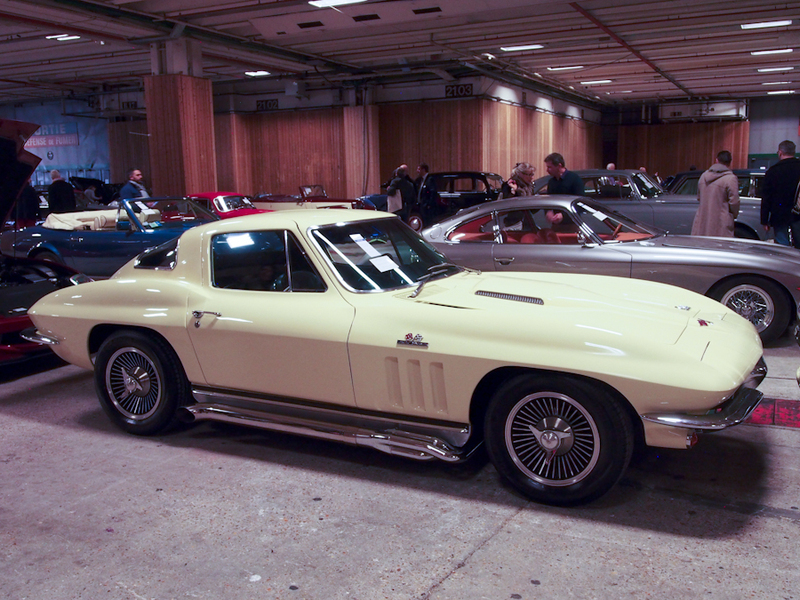 Even American cars sold well at Artcurial, but the panoply of French cars was wondrous to behold. 2-day sale with Ferrari 335 Sport sold for $35,031,659, over half the total in one lot. 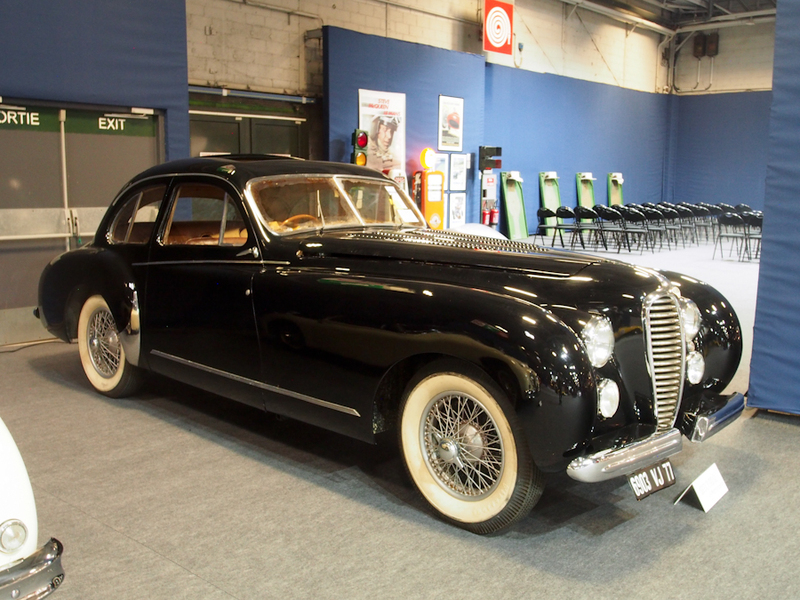 Lot # 22 1951 Delahaye 135M Coach Gascogne, Body by Dubos; S/N 801641; Engine # 801641; Black/Tan leather; Estimate $74,550 – $106,500; Visually maintained, largely original, 4+ condition; No Reserve; Hammered Sold at $106,500 plus commission of 16.00%; Final Price $123,540 – RHD. Silver painted wire wheels, wide whitewalls, Cotal preselector 4-speed, sliding sunroof, Marchal headlights, fog light and driving light, leaf spring steering wheel. – Tired but sound old repaint and interior, new uninstalled carpets. Delaminating windshield glass. Grungy engine and chassis. A project, but a good, complete, solid one and a place to start. – An intriguing old car but anywhere but in France its severely compromised condition would condemn it to a marginal price. Here, however, it brought a magnanimous price that imagines accolades for resurrecting it, and more credit to the buyers who saw its potential, if not their generous price for it. Lot # 56 1970 Ferrari 365 GT 2 + 2, Body by Pininfarina; S/N 13339; Silver/Black leather; Estimate $170,400 – $213,000; Visually maintained, largely original, 3- condition; With Reserve; Hammered Sold at $202,350 plus commission of 16.00%; Final Price $234,726 – Painted spoke Borrani wire wheels, Michelin XWX tires, Blaupunkt cassette, power windows. – Dirty wheels and road grimy underbody and chassis. Surface cracked original upholstery. Ripply bumpers and some peeling, scuffed trim chrome. Orderly engine compartment, but largely neglected and nasty. 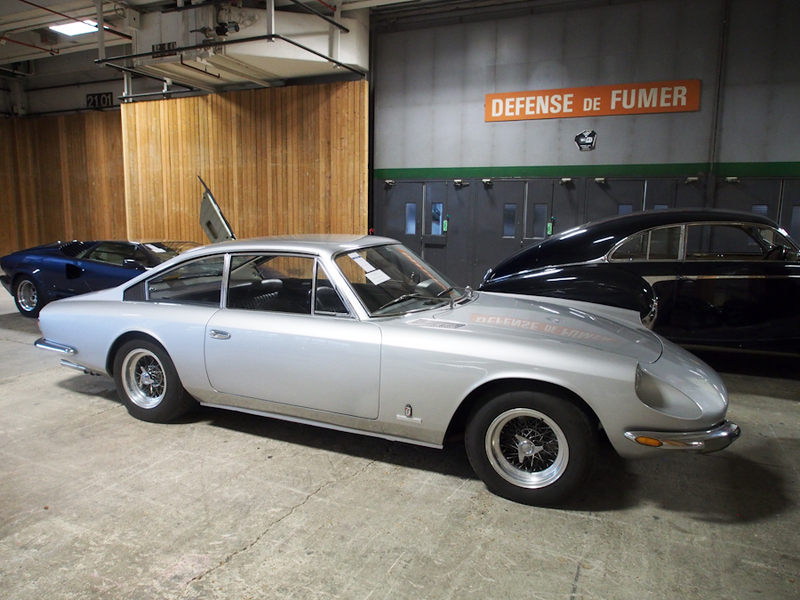 – The needy condition of this 365 GT 2+2 didn’t escape the Artcurial Rétromobile bidder and they returned a price that is appropriate, if not a bit generous. Lot # 66 1962 AC Aceca Bristol Coupe; S/N BE819; Engine # D21141; Red/Tan vinyl, Red piping; Estimate $143,775 – $197,025; Cosmetic restoration, 3 condition; With Reserve; Hammered Sold at $133,125 plus commission of 16.00%; Final Price $154,425 – RHD. D2 Bristol engine. Silver painted wire wheels, Michelin XC mud and show tires, woodrim steering wheel, removable faceplate stereo, bumperettes. 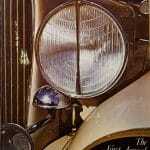 – Sound older repaint, replaced interior and chrome trim. Cloudy rear window. Orderly underbody. Cosmetically redone and usable as is but far from satisfying in either presentation or history. – Believed to be the second-to-last Aceca Bristol built, a distinction that is quite thoroughly overcome by the mediocrity of its presentation. Represented as restored, it’s not what most people would expect and is appropriately considered in this compromised result. An enjoyable driver, its price precludes a real restoration but is a sound value at this price. 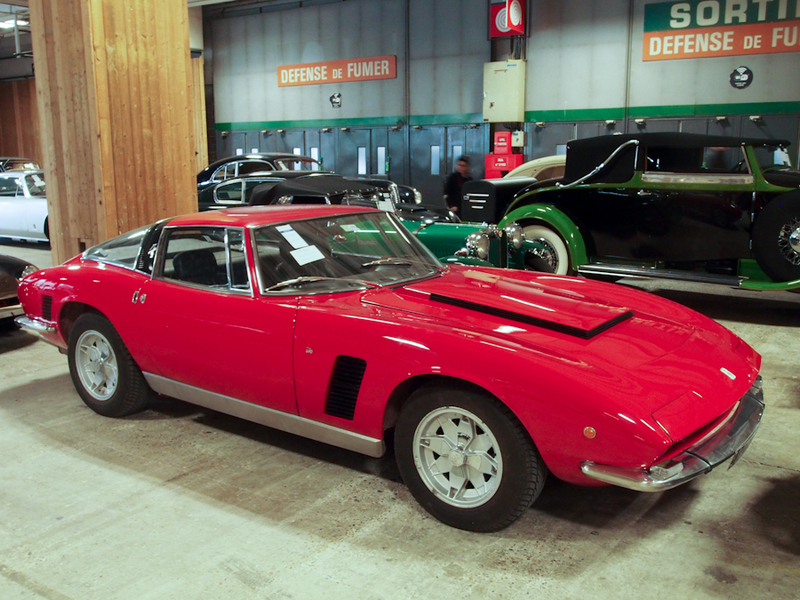 Lot # 73 1971 Iso Grifo Series II 7.4L ‘Can-Am’ Coupe; S/N 120342; Engine # T0306CZU1539; Red/Black leather; Estimate $298,200 – $383,400; Visually maintained, largely original, 3- condition; With Reserve; Hammered Sold at $394,050 plus commission of 16.00%; Final Price $457,098 – 454 Chevrolet, 5-spoke alloy wheels, Goodyear Eagle tires, power windows, Blaupunkt multiband radio. – Sound old repaint that couldn’t bother reinstalling the outside mirrors, or even filling the holes on the passenger’s door. Dirty old undercoat underneath. Scratched, weak chrome. Sound, lightly surface cracked original interior. A superficially presented auction car. – A sweet car, but no more than nasty in its presentation. 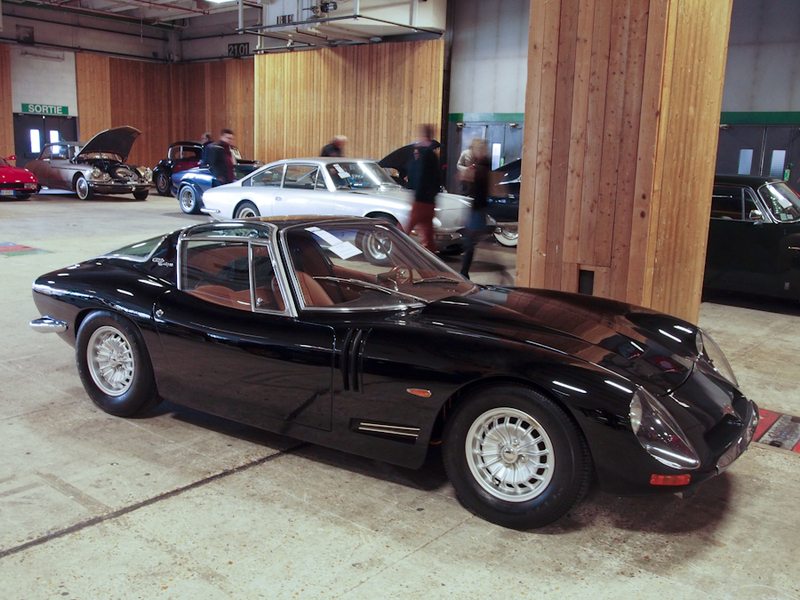 This Grifo has no good surprises for its new owner. ‘Superficial’ only begins to describe its condition. The seller should be lighting candles for this result, a miracle price for a seriously scruffy car. Lot # 74 1969 Bizzarrini GT Europa 1900 Coupe; S/N B508; Dark Blue/Cognac leather; Estimate $266,250 – $372,750; Cosmetic restoration, 3 condition; With Reserve; Hammered Sold at $272,640 plus commission of 16.00%; Final Price $316,262 – 2.4 liter Opel drivetrain (original 1.9 Opel included), Campagnolo alloy wheels, Goodyear tires, power windows. – A micro Grifo. Sound older repaint that didn’t bother filling the holes for the outside mirrors or reinstalling the mirrors. Sound replaced upholstery, good gauges. Peeling old undercoat in the rear wheel wells. Ripply bumpers; weak, scuffed window trim chrome. An unusual little car, but one with needs and probably no good surprises. – One of twelve built, languished in the Belgian importer’s inventory until 1973. The superficial restoration is not an advantage, but the car is beautiful. The price, however, is more than enough for a Chevy-engined Grifo, and this isn’t Chevy performance. On the other hand, I’ve never seen one before, nor even heard of the Europa’s existence. Lot # 75 1972 Lamborghini Miura SV Berlinetta; S/N 5050; Engine # 30738; Red, Gold sills/Tan pigskin; Estimate $2,343,000 – $2,769,000; Recent restoration, 2 condition; With Reserve; Hammered Sold at $2,183,250 plus commission of 13.76%; Final Price $2,483,580 – Borletti air conditioning, Gold alloy centerlock wheels. split sump. – Restored like new with just a hint of wear on the seats. Represented as the original drivetrain, four owners and 42,569 km. 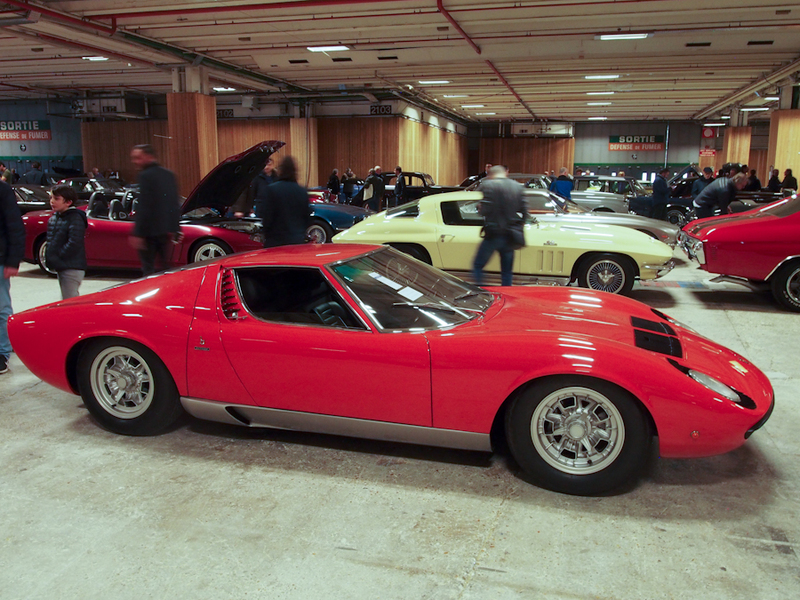 – The ultimate Miura, restored to like new condition without going too far and bought for an appropriate price. 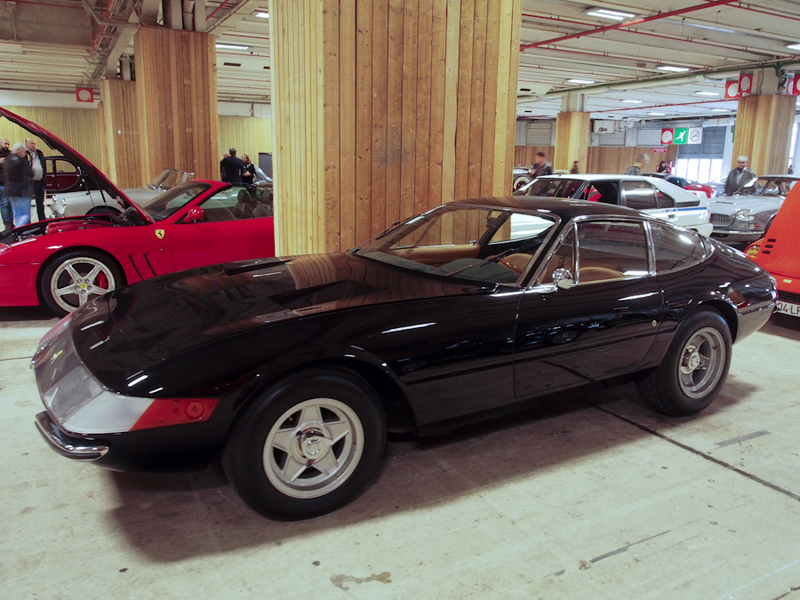 Lot # 85 1970 Ferrari 365 GTB/4 Daytona Berlinetta, Body by Pininfarina; S/N 13433; Engine # 408; Black/Tan leather, Black stripes; Estimate $798,750 – $905,250; Older restoration, 3+ condition; With Reserve; Hammered Sold at $713,550 plus commission of 16.00%; Final Price $827,718 – Plexiglas nose panel, fixed headlights, Grey painted alloy centerlock alloy wheels, Michelin XWX tires, Veglia air conditioning, Becker Europa stereo. – Good older, paint, major chrome and interior. Wiper scuffed windshield trim, thin quarter window frame chrome. Underbody was done like new, then driven, which is the best use of this Daytona. Ferrari Classiche certified. – A well used but attractively and consistently maintained Daytona with the desirable early fixed headlights behind the Plexiglas nose panel. The price it brought in dollars is generous; the price in Euros is excessive. This is an expensive Daytona. Lot # 86 1974 Dino 246 GT ‘Tipo E’ Coupe; S/N 06416; Engine # 142536; Rosso Dino/Black vinyl; Estimate $213,000 – $266,250; Visually maintained, largely original, 3- condition; With Reserve; Hammered Sold at $240,690 plus commission of 16.00%; Final Price $279,200 – Cromodora alloy wheels, Firestone tires, power windows, Voxson 8-track stereo, headrest seats. – Orange peely repaint, worn but sound original upholstery. Erratic masking, peeling paint on the door window frames. Dented right sill; bad scrape at the back of the driver’s door. Underbody is not done. Water stained dashtop. – This transaction creates an opportunity for the new owner to address some of the cosmetic details while driiving the car without concern for bugs, stone chips and even parking lot door dings. At some point it will be ideal for restoration (or at least a better repaint than the one it has) but the opportunity to really enjoy a Dino shouldn’t be passed up, especially at this modest price. Lot # 87 1966 Dino 206P Berlinetta Speciale, Body by Pininfarina; S/N 0840; Engine # 222N10834; Red/Red vinyl, Beige inserts; Estimate $4,260,000 – $8,520,000; Unrestored original, 3- condition; No Reserve; Hammered Sold at $4,046,628 plus commission of 12.95%; Final Price $4,570,563 – RHD. – This is Pininfarina’s prototype for the Dino 206 GT, built on a 206P tube frame race car chassis and exhibited at the 1965 Paris Auto Show, at Turin later and in New York in 1966. 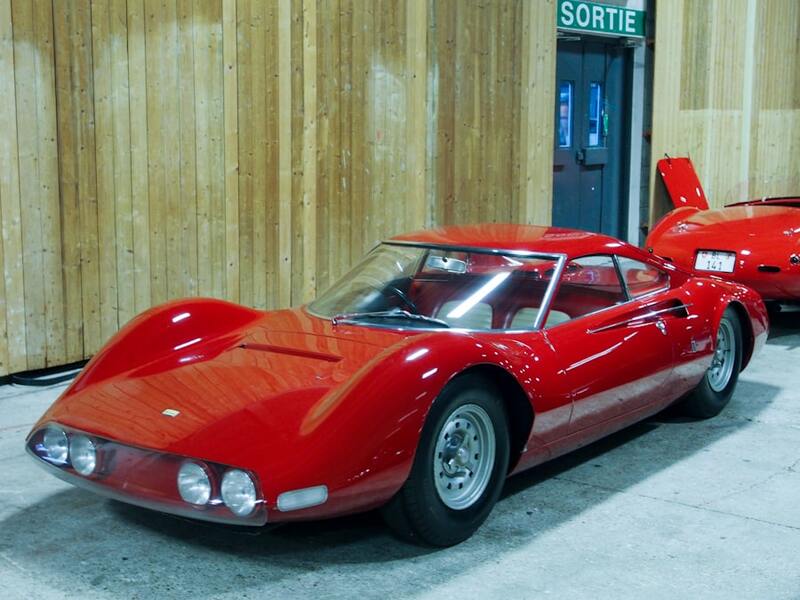 Later donated to the Le Mans museum by Pininfarina and Ferrari which still owned the chassis. Sold by the museum here after four decades on display. Cracked, chipped old paint, weak chrome (what there is of it), oxidized alloy wheels. Aged and somewhat neglected but still beautiful. – This one-off Pininfarina show car, the roots of the Dino family tree, will be a welcome entrant anywhere whether in its present original condition or after a comprehensive restoration to better than new. It is an extraordinary piece of Ferrari and Pininfarina history, superbly promoted by Artcurial and there can be no argument with the price it brought. 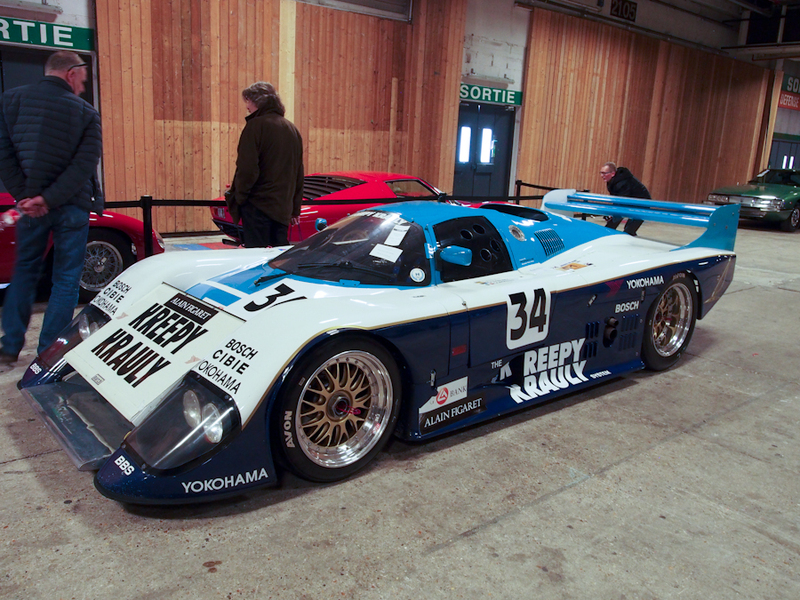 Lot # 93 1984 March 84G Group C; S/N 84G03; White, Two tone Blue ‘Kreepy Krauly’/–; Estimate $532,500 – $745,500; Competition restoration, 2- condition; With Reserve; Hammered Sold at $319,500 plus commission of 16.00%; Final Price $370,620 – RHD. Porsche 956 700hp drivetrain. – Raced new by Kreepy Krauly with mixed success including appearances at the Daytona and Le Mans 24 hours in 1985 and 1986 with Costas Los. Restored to good historic racing condition with good paint and chrome, a few body cracks and chips but nothing of any significance. Serviceable historic racing interior. The important bits are clean, sharp and look ready to race. – As a competitive historic Group C entry this March has a lot going for it, especially as it comes at a price that is much less than a Porsche 956/962, in some cases a million dollars or so less. 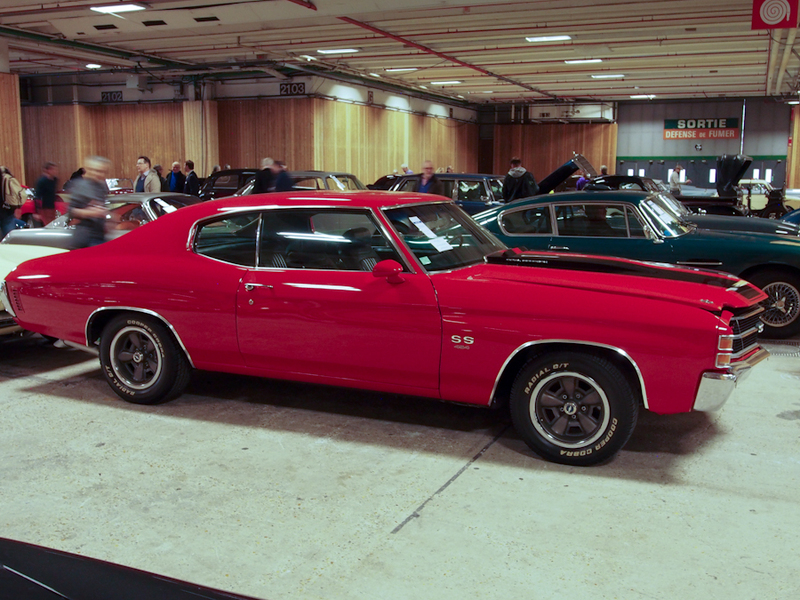 Lot # 101 1971 Chevrolet Chevelle SS 454 2-Dr. Hardtop; S/N 136371I514228; Red, Black stripes/Black vinyl; Estimate $42,600 – $63,900; Recent restoration, 2- condition; No Reserve; Hammered Sold at $40,470 plus commission of 16.00%; Final Price $46,945 – 454/360hp LS5 with a L88 cam, automatic, power front disc brakes, Koni shocks. Rally 2 wheels, Cooper tires, buckets and console, cowl induction hood, tilt steering column, headrests, AM-FM, cruise control, power steering, power front disc brakes. – Good repaint with a few minor flaws, good interior and chrome. Lightly pitted door handles. Clean, nearly like new underbody. 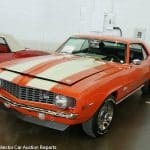 An unusual American style muscle car restoration done in Europe to standards that would satisfy any American collector. – Represented as an authentic SS 454, but not claiming the original driveline, the questions are significant but at this price make no difference at all. Lot # 102 1966 Chevrolet Corvette 427/425hp Coupe; S/N 194376S109204; Sunfire Yellow/Black vinyl; Estimate $53,250 – $85,200; Cosmetic restoration, 2- condition; No Reserve; Hammered Sold at $85,200 plus commission of 16.00%; Final Price $98,832 – 427/425hp, 4-speed, chrome side exhausts, alloy wheels, Bridgestone tires, AM-FM. – Represented as matching numbers. Very good paint, good chrome and interior. Underbody has been sprayed chassis black while assembled. A good driver quality cosmetic restoration. – Big, lusty, vociferous American V8s don’t often show up in European auctions but when they do they bring prices that show just how appreciated they are. This 427/425hp ’66 Corvette coupe brought a price that it would find it hard to attract in the U.S. It’s not unrealistic, just ambitious. Lot # 112 1990 Mercedes-Benz 190E 2.5-16 EVO II 4-Dr. Sedan; S/N WDB2010361F740617; Anthracite Grey Metallic/Black leather; Estimate $85,200 – $127,800; Unrestored original, 2- condition; No Reserve; Hammered Sold at $170,400 plus commission of 16.00%; Final Price $197,664 – Becker Grand Prix stereo, 5-speed, air conditioning, mobile phone, sliding sunroof, lowered, 17 inch alloy wheels, Michelin Pilot Sport 40-profile tires, documented with the original purchase invoice, books, duplicate keys, tool roll, accessories and spare wheel/tire. – Very good paint with a few stone chips on the nose. Good original interior. Clean underbody. Not quite like new, but very close and obviously babied for many years. Two owners from new, shows 54,400 kilometers, probably all it has covered from new. 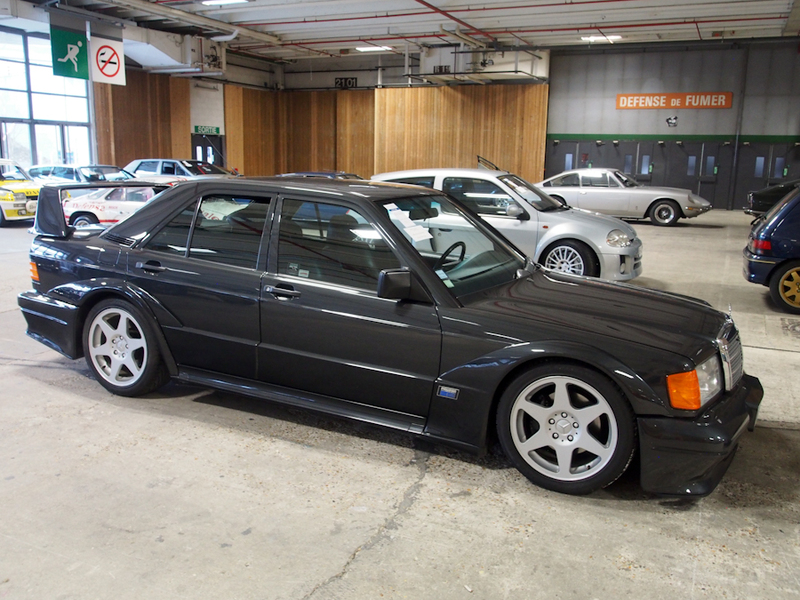 – This is an especially sharp 190E 2.5-16 that has enjoyed a life of privilege and doting care and the Artcurial bidders seized upon it with vigor. After not seeing one for years there have been three Evo IIs offered since the beginning of the year, selling for $220,000 at RM in Arizona and $157,300 at Bonhams Scottsdale, which puts this transaction squarely in the frame. Lot # 119 1987 Porsche 959 Komfort Coupe; S/N WP0ZZZ95ZJS900197; Engine # 65H00285; Metallic Graphite Black/Grey leather; Estimate $1,011,750 – $1,278,000; Unrestored original, 2- condition; With Reserve; Hammered Sold at $1,011,750 plus commission of 15.79%; Final Price $1,171,500 – Blaupunkt cassette stereo, power windows, all accessories including keys and manuals – All original with very good original paint and barely worn, lightly creased upholstery. Underbody is barely used. Two owners and the has covered only 25,547 km from new. The car looks like less use and is all but showroom ready – This is the third 959 Komfort offered since the beginning of the year and is the most expensive of the trio, although not by much. 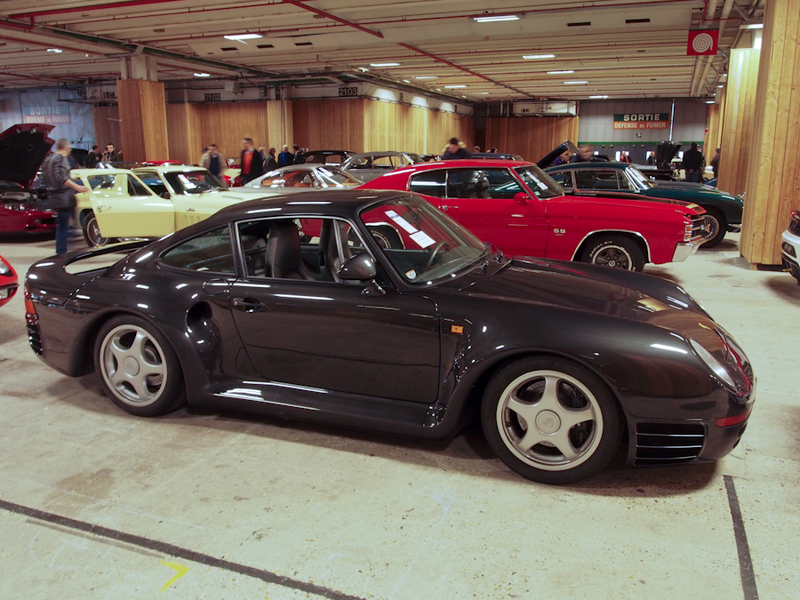 A technical triumph with breakthrough details throughout, recent Porsches have more power but none represents the engineering milestone of the 959. Lot # 120 1960 Lamborghini Miura P400 Berlinetta, Body by Bertone; S/N 3646; Engine # 2193; Red, Silver sills/Black leather; Estimate $852,000 – $1,065,000; Recent restoration, 2 condition; With Reserve; Hammered Sold at $793,425 plus commission of 16.00%; Final Price $920,373 – Silver centerlock alloy wheels, Michelin XWX tires. – Restored by Bachelli et Villa, original engine. Very good paint and interior. Underbody and chassis are like new. Impossible to fault. Described as regularly used yet evidence of such use is impossible to find, such was the level of care and maintenance. – It would be great to see this Miura in its original Miura Green paint, but it is so good in the present Rosso that redoing it would almost be sacrilegious. Bought modestly for its presentation but in line with recent Miura P400 transactions, this is a solid value in an early Miura. 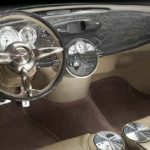 Lot # 125 1948 Ferrari 166 SWB Spider Corsa, Body by Scaglietti; S/N 014I; Engine # 014I; Red/Brown imitation snakeskin; Competition restoration, 2 condition; No Reserve; Hammered Sold at $2,715,750 plus commission of 13.41%; Final Price $3,079,980 – RHD. Silver painted wire wheels, full width windscreen. – Short wheelbase, underslung rear frame, believed raced by Ferrari, then sold to Giampiero Bianchetti and raced through 1952. Originally a spyder corsa with cycle fenders by Ansaloni. 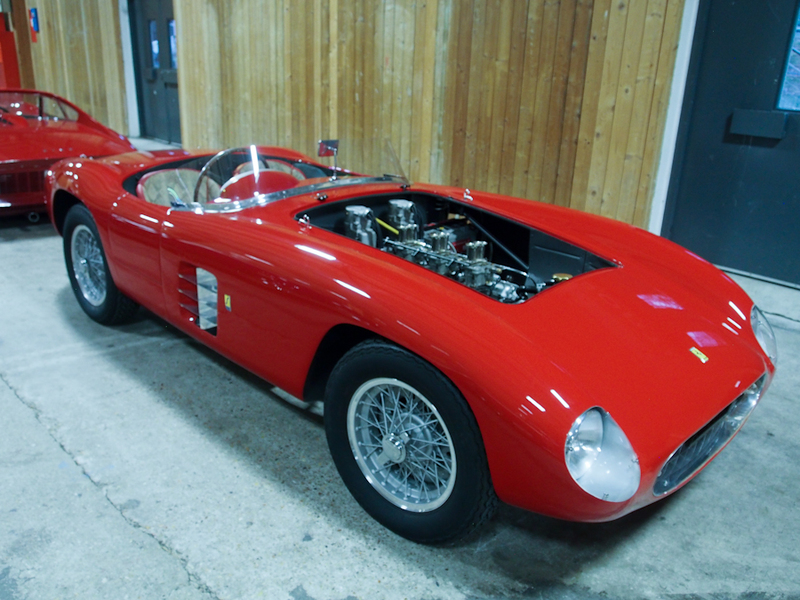 Rebodied by Scaglietti with this 500 Testa Rossa-style body in 1956 and acquired by Nico Gianella in Switzerland in 1957 who brought it to the U.S. when he acquired a Mobil gas station in Santa Barbara. Sold to Michael Peake in 1962, then to Norman Blank in 1969 who owned it until he died in 2003. Restored in 2015 in Germany and like new; just right and not too much. – This Ferrari has an ‘interesting’ history of continuous experimentation with bigger engines, a shortened chassis and a variety of bodywork including the present body, an early Scaglietti creation that some claim was the mule for the 250 TR coachwork and apparently once had the bubble fenders and brake ducts of the TR. 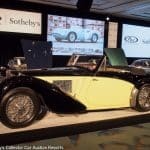 It was sold by Gooding at Pebble Beach in 2007 in rough, nearly barn find condition for $1,045,000, offered by Gooding at Pebble Beach in 2011 after mechanical sorting but unsold on a bid of $1,300,000. It now is a much better, essentially as-built, car and is no more than appropriately valued for what it is. It has a long history with Ferrari throughout its early life, but is nowhere near as it left the factory in 1948. It’s a quandary for Ferrari Classiche, but not for its new owner who now owns an in-the-flesh timeline of Ferrari’s development process in the Fifties. Lot # 129 1962 Austin Healey 3000 Mk II BT7 Roadster; S/N HBT7L16708; Engine # 28518; Ice Blue/Red vinyl; Estimate $53,250 – $74,550; Modified restoration, 3- condition; No Reserve; Hammered Sold at $38,340 plus commission of 16.00%; Final Price $44,474 – Aluminum cylinder head, alternator, headers, stainless steel exhaust, Mallory ignition, chrome wire wheels, Michelin XWX tires, front fender vents and left front fender access panel fixed back seats, Moto-Lita leather rim steering wheel, shift knob overdrive switch, no bumpers. – Flawed old repaint with rusty cracks at the hood scoop corner. Uneven trunk gaps and door fits. Worn, stretched upholstery, dirty carpets, dull cockpit surround trim and windshield posts. Dirty, surface rusted underbody. Looks good at thirty feet, but should run like a bear with the engine modifications and wide wheels and tires. – This Healey is represented as ‘matching numbers’ but it hardly counts with the modifications. Aside from that and the deteriorated older restored condition it promises to be a delightful driver, with room in the back for a couple of impressionable grandkids. The Artcurial Rétromobile bidders paid all the money for it, but even that is but a few thousand Euros over what a similar stock BT7 is worth and the extra performance makes up for all of, or even more than, that. There should be no quibbles with the result. 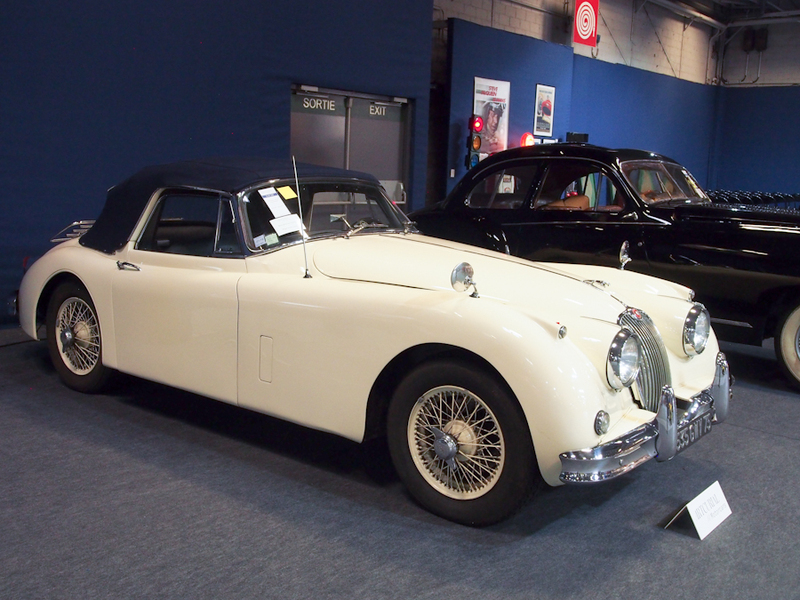 Lot # 137 1960 Jaguar XK 150 3.8 Drophead Coupe; S/N S838763DN; Engine # VA1571-8; Cream/Grey leather; Blue cloth top; Estimate $106,500 – $127,800; Visually maintained, largely original, 3- condition; With Reserve; Hammered Sold at $95,850 plus commission of 16.00%; Final Price $111,186 – Body color wire wheels, Vredestein tires, luggage rack, fender mirrors, Becker Grand Prix radio, 4-speed, overdrive, leather rim steering wheel. – Decent older repaint and top. Good but aged original interior, sound chrome. Chassis and underbody are dirty and covered in road grime nodules. A sound and complete car that needs little to be driven and enjoyed. – Appropriately valued for its condition and 220hp 3.8 liter engine. It’s not an XK 150S but the missing 45hp aren’t likely to make much difference on a leisurely road tour … unless, that is, an S shows up and wants to have an acceleration contest. Then, absent some superb gear shifting, this 3.8 is toast. Images and text ©2017 Richard S. Carey. issue. I realy lijke aall off the points yoou made. made good content as youu did, thhe webb wikl bbe a lott more usful tban ever before.